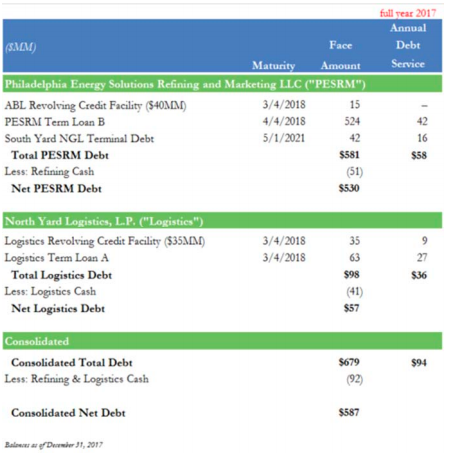 1/21/18 Recap: Operator of refining complex with combined distilling capacity of 335,000 barrels/day of crude oil - representing roughly 28% of the east coast's refining capacity - and located roughly 2.5 miles from downtown Philadelphia filed a prepackaged bankruptcy in Delaware for the purposes of effectuating a sale. The company blames (i) regulatory compliance costs that specifically penalize independent merchant refiners (related, specifically, to the Clean Air Act), (ii) adverse macroeconomic trends in energy, and (iii) adverse government policy decisions for its chapter 11 filing. The goal of the prepackaged filing is to allow for an infusion of $260mm in new capital, a $35mm reduction of interest expense, and to kick maturities out to 2022. We're a little late to the game here with our summary so we'll say something that we haven't seen anyone else say about this just yet: that is, that this never would be able to file in Delaware if Elizabeth Warren has her way and the new bankruptcy reform bill is passed. Just sayin. Capital Structure: See chart below.